On the Menu Tonight! Abalone are a type of edible sea snail and their meat is a highly sought after food. Handle with Care! 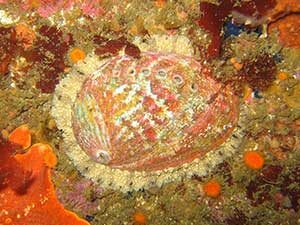 Abalone blood has no clotting mechanism and if injured they will bleed to death. Jewels of the Sea! Prized abalone shells are used in jewelry making. A Hard Catch! Use of SCUBA equipment is prohibited when hunting abalone in California; divers must hold their breath when diving for abalone. Recovering with Protection! Abalone at Point Lobos was once so abundant that they accounted for over 75% of the abalone sold in California. Now, populations of abalone are still struggling to rebound despite strict protections.